Earlier this summer, I received an email for a special dinner at a local eatery – St. Clouds in Seattle. The invitation read “we are strong supporters of and believers in the workers of the world (starting with our crew at St. Cloud’s) and taking a cue from our neighbors to the South in Cuba and Latin America who celebrate International Workers Day, we’ll serve Cuban food specials, Mojitos and Cuba Libres, and party all evening with the Supersones – the hottest Latin band we know, purveyors of gyratable Cuban son music, Latin salsa, and the best in celebratory music.” How could I resist?!? Community minded, the wonderful owners of St. Clouds have sponsored a cooking-for-the-homeless day every third Wednesday of every month (ten years and counting) to prepare meals for the homeless. They invite volunteers to assist with shopping, cooking and packaging the food. I asked my friend Eileen to join me for this celebratory dinner to support the cause. And to have some fun! Always spontaneous, she agreed to accompany me and I was anxious to introduce her to one of my favorite Seattle neighborhood restaurants. It was a rare, balmy Seattle evening, and we were seated in the courtyard underneath an outdoor heater. It felt like we were attending the Oscars; we gawked at men with fedoras, women with short red dresses and even ladies older than the two of us as they arrived in their dancing attire. One of the many things I love about St. Clouds is the variety of patrons. On any given night I’ll see everything from families with rambunctious two year olds to hipsters adorned with tattoos. The owners seem to know and talk to their “regular” customers but greet everyone who enters with warmth and joviality. After our extravagant dinner followed by apple pear pie for dessert, we were beyond full. We just wanted to sit and relax. Yet the band was playing incredible music and Eileen and I found ourselves dancing in a tiny space by the band. Soon the wait staff and many other patrons joined us on the dance floor! We burned a few calories and stayed until well past 10:00 pm. 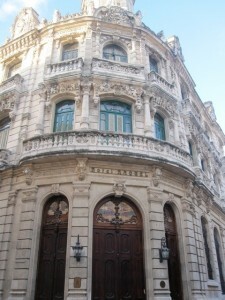 My youngest sister Kay traveled to Havana, Cuba in December 2010; she sent these pictures so I could get a sense of the city. She told me that, back in the 1940s, Havana was much like Barcelona – very European and featuring gorgeous architecture throughout the city. 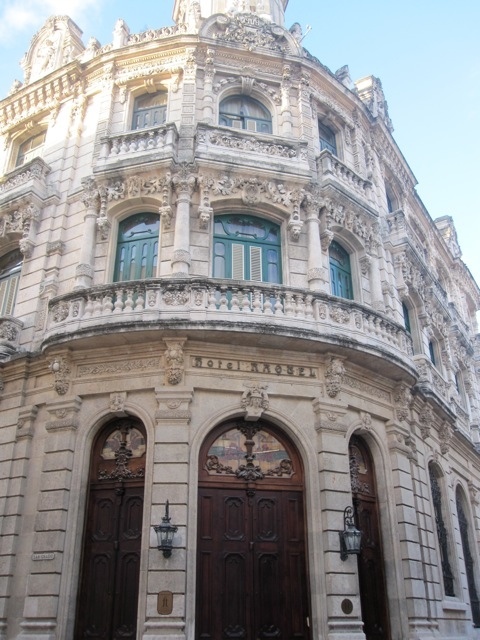 Today Havana is very run down – buildings are not maintained at all and 90% of them are quite dilapidated and in need of restoration and repainting. 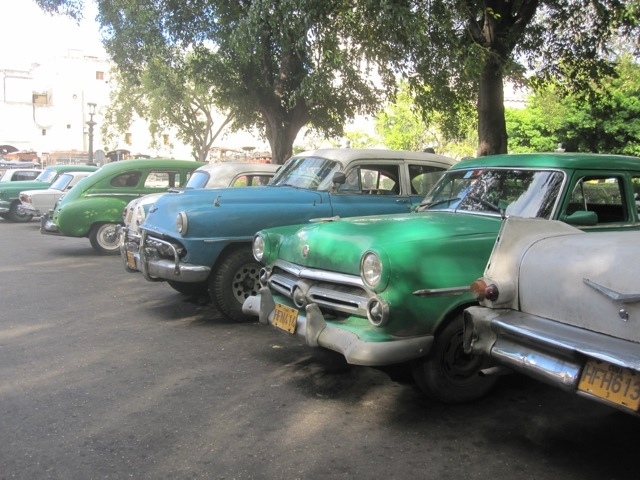 There are very few cars due to the cost and pervasive poverty; the taxi cabs are apparently old, large cars from the past. Regardless, I hope to travel to Cuba some day. In the meantime, I am fortunate to have the wonderful food at St. Clouds. Speaking of food … I must write about the delicious dishes we sampled during our Cuban Night. 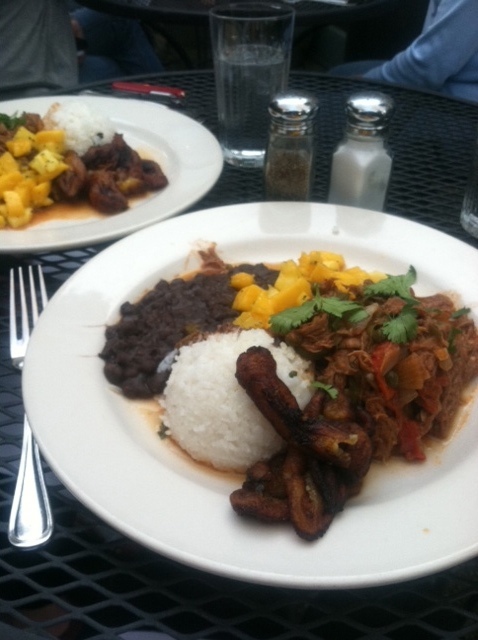 We ordered one of the “specials”: “Cuban-style” braised, pulled beef flank steak served with a mound of stewed black beans, jasmine scented rice, fried plantains and cubed mango. The textures and colors and aroma were out of this world. And the taste…the taste. My taste buds were dancing. Sweet, salty, sour, bitter – the meal fired on all cylinders. I cornered owner John Platt and asked him how the meat was prepared; already the wheels in my mind were turning and I planned to try to create the flank steak in a simpler way at home using a chuck roast and my trusty pressure cooker. He was kind enough to jot down a kind-of-sort-of-guestimate of how he cooked and seasoned the meat. I then went to MY global kitchen and made a darned good rendition of pulled beef. Below is my version – I encourage you to put on some loud, Latin music and give it a try! Heat empty 5-quart pressure cooker for a couple minutes on medium high, add oil until it is hot. With tongs, add meat and brown on both of the large sides, each for about 3 minutes. Gently lift the meat out of the cooker, and season both sides with just a little salt and with ground pepper. 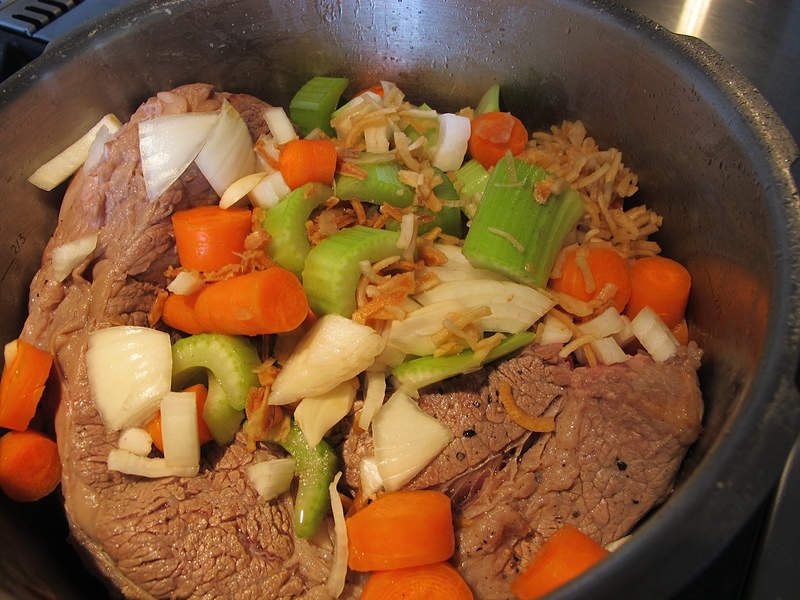 Shred the beef and drain off most of the liquid (add it to the cup of juice in your fridge). Combine the shredded beef in a large glass bowl with about half of the lime and orange juices. Meanwhile, use the same pressure cooker to sauté the rest of the vegetables – pepper, onion, jalapenos, garlic and tomatoes – until glossy and soft. (Note: I highly recommend wearing gloves to chop your jalapenos! I didn’t and, even though I thoroughly washed my hands, my eyes BURNED when I took out my contacts that night.) Add the shredded beef that was marinating with the rest of the lime/orange juice. Add about ½ cup of tomato/pepper mixture with the listed spice and enough beef juice from your initial pressure cooking or oven roasting to make the beef stick together. Serve topped with chopped fresh cilantro. To be authentic, accompany with steamed rice (I always do brown jasmine, which is not authentic – oh well) and stewed black beans and cubed mango. Bon Gusto!! I use leftovers chopped into hash with leftover red beets and potatoes – like red flannel hash. I like to top this with poached eggs – YUM! I always freeze the extra juice from the meat and use it as a base for vegetable soup. It’s an enriched, highly flavorful beef stock. Check out more at Wanderfood Wednesday! This entry was posted in Central America, Meat, North America and tagged Cuba, Havana, Pulled Beef, St. Clouds. Bookmark the permalink. We are St. Cloud regulars and glad to see this shout out to them because they ROCK. John and his crew are the best. One of Seattle’s best neighborhood restaurants, bar none. They do wonderful philanthropic work as a bonus to their terrific food!